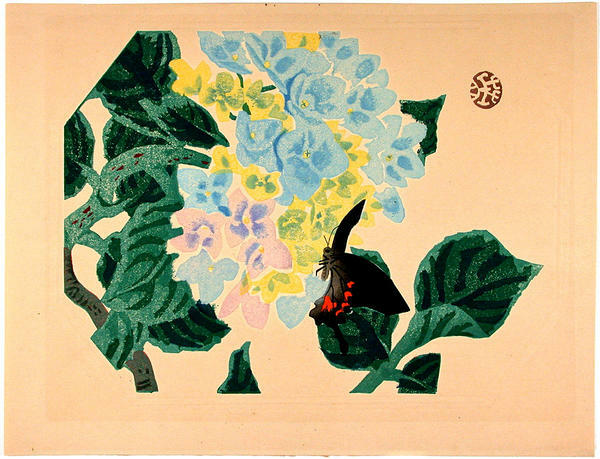 [Go Back] [New Search] Details for Kotozuka Eiichi (1906-) "Butterfly and Hydrangeas"
Notes (1st edition)? : The first edition of this series of 50 prints appears to have been sold to subscription buyers via periodic sets of five prints (perhaps each month). With the completion of subscription purchases a second edition of all 50 scenes was then published in April 1936. Subscription sales were a very common method of selling large print series. Series Information: The first edition of this series of 50 prints appears to have been sold to subscription buyers via periodic sets of five prints (perhaps each month). With the completion of subscription purchases a second edition of all 50 scenes was then published in April 1936. Subscription sales were a very common method of selling large print series.